Gun shows are held at the Club on a weekend in January and in July respectively. 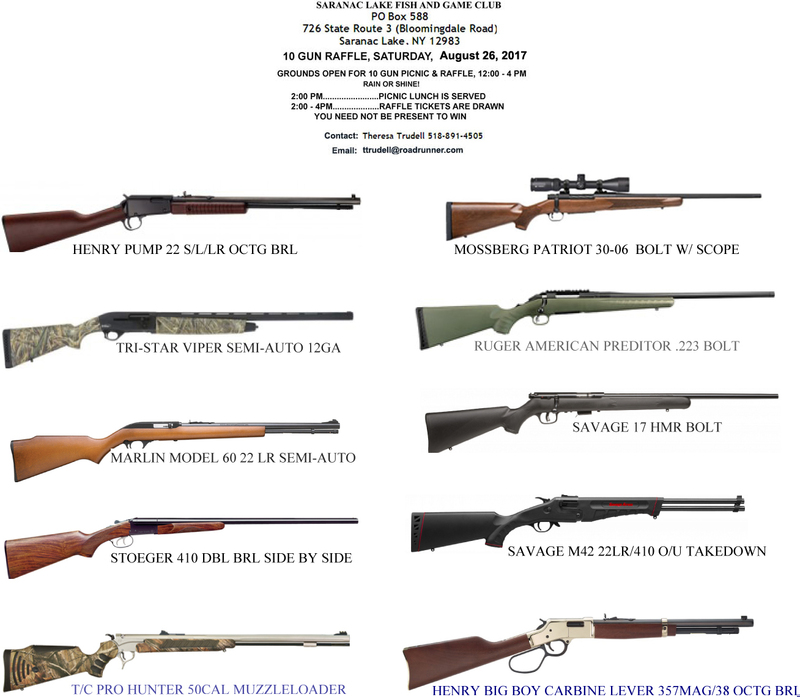 Dealers from the around the North Country display their stock, providing opportunities for buying and selling firearms, ammunition and accessories. The Colby Classic Ice Fishing Derby is held on the first weekend of March on Lake Colby. Registration, before fishing, is between 7:00am and 4:00pm each day. The registration area is at the Lake Colby Public Beach. All fish must be caught between 7:00am and 4:00pm. Fish caught in Lake Colby are brought immediately to the weigh-in area to be judged and weighed. NO FROZEN FISH ARE ACCEPTED. The Kids' Fishing Derby on Lake Colby is held on Fathers' Day from 8AM to Noon. Free hotdogs, chips and soft drinks are served. There is a 1st and 2nd prize in four or five catagories depending on whether bass season is open. There is also a door prize for all entrants. Open to kids who do not need a license to fish (up to and including 15 year olds). Only fish caught in Lake Colby are eligible for prizes. Fish must have been caught by the kid entering it in the contest. Adult help is kept to a minimum. The Trudeau Big Buck contest has been held annually for many years. Past winner names can be found on the plaques in the first room of the Club House. Any one can enter but you must enter prior to the opening of the season you plan to hunt. For example, if you are going to hunt in the archery season you must enter before that season starts. Early muzzle-loading big game is in the contest but late muzzle-loading in the Saint Laurence area is not. In most years, the only place to sign up is at the Blue Line Sport Shop in Saranac Lake (81 Main Street). The cost to enter includes all big game seasons. All entries must be weighed at the Blue Line Sport Shop and must be gutted before being weighed. There are prizes for each category (Archery, Muzzle-loading, Regular Big Game) based on the heaviest weight, and the overall heaviest deer in the Contest gets the big prize. Only Adirondack bucks can be entered in the contest. No down state deer are permitted. A potluck dinner for Members and their families is held in February at the Club House. All dishes are welcome, especially game taken in the recent hunting seasons. A kids' soap box derby is held each spring in Saranac Lake. Interested Club Members help with the event. For details on the Derby, go to the Daffest Derby website. The Christmas Pie Sale occurs on the Saturday of the week before Christmas. This has been a traditional fund raiser for about 30 years. A small group of volunteers call the membership by telephone asking each household to make a bake good. We only sell homemade bake goods and feature pies. (If a pie is brought down that is not homemade it does not go into the sale) If the member does not bake pies then they supply homemade cakes, cookies or stollen. Berry and fruit pies sell the best and we get premium prices for our pies. A large berry or fruit pie would be sold in the neighborhood of $18. We know that the costs of making large juicy pies is not cheap and we value the labor and love in the making of such pies. Mincemeat is another big seller (we need to know if it is beef or venison) as is Coconut Cream. Some members specialize in some way. One member is known for her monster cookies while another makes sugarless baked goods for diabetics. Over the years we have changed locations. It was in Ames for quite a while and when they went out of business it was in Blueline Sports Shop for several years. In 2013 we were in Ace Hardware and did well. Bakers bring their pies to us between 8:30-10:00am and we sell from 9:00 until about 1:00pm. Bob Brown has chaired it for several years. To run the event, four phone callers are needed two weeks before the event and 4-6 members to run the event on sale day. If a member cannot bake an item for the sale we ask that they come down and buy a bake-goods on the day of the sale. We pride ourselves in having the best bakers in the area. The Raffle and Picnic is held on a Saturday in late Summer. Purchase a couple of tickets for a chance to win a brand new rifle, shotgun or cash. Pictures of the guns and details are below. This is the club's biggest fundraiser for the year and if you would like tickets to sell to your friends please contact Claude @ 518-891-3580 or Theresa @ 518-891-4505. The picnic and ticket drawing this year is on August 26 from Noon to 4 PM. You need not be present to win. All winners must have a U.S. Residence and pass a N.I.C.S. check. All winners will be responsible for any delivery fees.